Barcelona forward Lionel Messi has said that he “never imagined having so much success” after being presented with a record fifth European Golden Shoe award. The Argentine scored 34 goals in 36 La Liga appearances in 2017-18, making him the highest goal-scorer in Europe ahead of Liverpool’s Mohamed Salah (32). 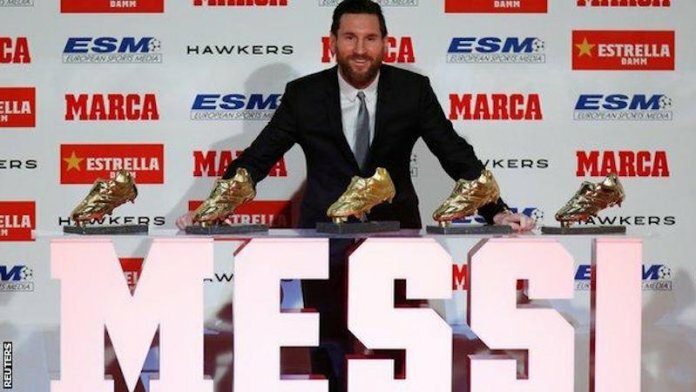 Messi currently leads Europe’s goal-scoring charts once again, with 14 goals so far this term, as he targets a sixth Golden Shoe award.